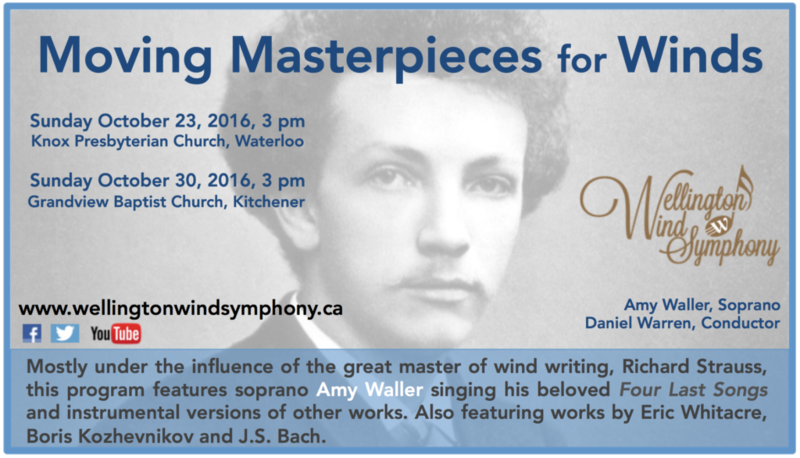 When Jan Narveson of the Kitchener Waterloo Chamber Music Society first suggested that Strauss’ wonderful orchestral arias be transcribed and performed by the Wellington Winds, the task seemed virtually impossible. The original instrumentation is enormous and dense, and the music accompanies a soprano soloist. Winds do not easily play as softly as the strings, so it seemed likely that the voice would be overpowered. Yet when one comes to examine the score, one finds that the composer has made extensive use of winds throughout. In fact, that is one of the miracles of this miraculous music. With the exception of one more short song with piano accompaniment, these are the last works from the octogenarian composer. They were written just after the Second World War, a time that had been devastating for the composer, whose artistic life had been utterly disrupted, and whose beloved family had been seriously threatened. He could not escape some involvement with the Nazis because his daughter-in-law was Jewish. She, though not her extended family, survived the war only because of Strauss’ insurmountable artistic reputation with the German public. As a result, Strauss suffered through a prolonged trial and denazification during the last few years of his life, even while he must have been tormented by grief at the loss of so much that he cared deeply about, especially that of so many friends and colleagues. In such circumstances, it was a further miracle that he found the resources to write this sublime music that has come to be accepted as being among the canon of rarest artistic merit. While these songs are stylistically unrelated to the music written during and immediately after the war, they nonetheless explore new musical territory, territory that only Strauss knew. It reaches unexplored zones of harmonic language delineated by an intense chromaticism which is nevertheless thoroughly grounded in tonality. Furthermore, perhaps no other composer ever wrote melodies that seem to stretch more achingly to unfinished possibilities. Then there is the way in which this melodic language is so richly intertwined, astonishingly especially in the lower ranges of the orchestration. Sometimes there are as many as twenty independent melodic parts, each of which has potent melodic value. Through all this, the composer achieved an almost perfect balance with the voice. The trick for anyone attempting to translate this music to a different medium is to maintain that delicate balance. In fact, the overall weight of the orchestration is not greater in this transcription than in the original, which calls for an orchestra of over 100 players. Astonishingly, the tutti orchestra is employed for the bulk of the time, even including divided strings in many places. With the greatly reduced numbers in this performance, the difficulty is sometimes to find enough players to cover all of the parts, and at other times to achieve the weight that the composer wants. This is especially true of the viola and cello parts. Strauss divides these sections to an unusual degree, and this imparts a very pronounced darkness to the colour of the music. Fortunately, the saxes, two altos, tenor, and baritone, when played with great sweetness, can stand in for the low strings. At the top of the orchestral landscape, it is often difficult to capture the sonorities of the first violins when transcribing for winds. However, because Strauss wants a richly dark sonority, he doesn’t make much use of the highest register of the violins, and when he does the range does not preclude the flutes playing those parts with delicacy. Finally, there is the issue of the length of the musical lines. Some of them are famous for their demands, even in the original, but here the winds must cover the string parts as well. The result is musical lines that are sometimes almost endlessly sustained. Performing this music is an extreme challenge for all of the players, but it is a privilege to make great chamber music on a grand scale. That is why one would transcribe such a work.